The island of Kefalonia which is also known as Cephalonia is the largest island of the Ionian Islands in the western Greece with 36.550 permanent habitats. Argostoli is known as the capital of this beautiful island. The island was almost razed in 1953 after one impressively strong earthquake and started to be rebuilt by its residents. Since then, the island is a continuously developing into a high quality tourist destination. 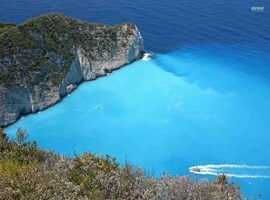 Between the beautiful Lefkada and the popular Zakynthos, it is a much loved cosmopolitan tourist trail. It seems to be growing each year as the number of visitors is increasing. It also hosts a number of interesting archaeological sites which are worth seeing. It is a perfect place to spend your holidays in Greece and have fun meeting new people and exploring new places. The people of Kefalonia are famous for their warm hospitality, their friendliness and their unique sense of humour. 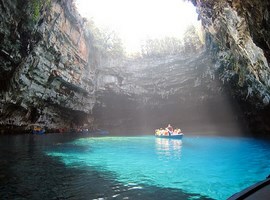 Kefalonia is often called as the ‘’mystery island’’ because of the many unusual phenomena which take place there. 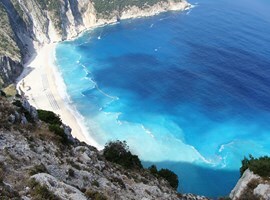 If we want to describe the island of Kefalonia in simple words, we can just say that is ‘’a great place to be’’. The town of Argostoli became the capital of the islands Kefalonia and Ithaki in 1757. It is the commercial and administrative centre of the island, a modern town which preserves its traditional characteristics, a place with beautiful neoclassical buildings and remarkable historical and cultural tradition. Through the years, the growing of Argostoli was significantly rapid. It is the second place in Greece which was electrically energized; it owned a waterworks, museums, theatres, sport facilities and producing units. Among the rest provincial Greek towns, Argostoli is considered to be a model. The purpose of the museum is to collect, record, classify, study and promote the Historical and Folklore culture of Kefalonia, the urban and rural way of life from the Venetian period until the catastrophic earthquake of 1953. In the Museum is also the Library which hosts a great informative and organized archive, available to researchers and visitors. The waterway is in the entry of the town and it is the meeting point for the fishing friends. It is ideal for a romantic walk along the path admiring the panoramic view of the town especially during the night. The waterway was constructed in 1811 by the governor of the island, Charles Fillip De Bosset. The Koutavos Lake is actually a lagoon, located in the Argostoli’s Gulf. It is a very important wetland which is the home for many bird and fish species. If you want to take a relaxing walk, the shoreline is that you’re looking for. Erissos is at the northern part of Kefalonia and hosts two of the most cosmopolitan areas of the island: Fiskardo and the picturesque Assos. Fiskardo is a meeting point for the sailing lovers and Assos is like a small paradise which offers calmness and relaxation. Archaeological places and monasteries can fill your time if you desire to visit them. Also, in Fiskardo works a professional diving school. The Ionian Sea seabed can easily steal your mind. Fiskardo is considered as the Greek Saint Tropez; a lot of Hollywood stars visit it every year, sailing boats from every place of the world come to FIskardo to enjoy the happy and cosmopolitan atmosphere. Sami is on the eastern side of Kefalonia and its characteristic is the distinguishable geological phenomena. It was also chosen in 2000 as the filming place for the Hollywood movie ‘’ Captain Corelli’s Mandolin’’ with Nicholas Cage and Penelope Cruz. After this, it became much more popular to the international visitors. In the area there is a cave park with the Drogarati, Agalaki and Zervati caves which are ready to being explored. Here lies the heart of the religious tradition of the island as the Saint Gerassimos Monastery is located here, a religious destination for thousands of Orthodox people. Also, the village is special for one more reason. Here is being produced the famous wine rompola, the traditional delicious wine of the island of Kefalonia. Every year in August, the Rompola Festival takes place at the central square of the village called Fragata with plenty of traditional dance, local food and of course wine for free. There is a myth which says that Liksouri and Argostoli have an old grudge about which of these two has to be the capital of the island. Liksouri is a modern town which was rebuilt after the 1953 earthquake. In the surrounding area are some of the most beautiful beaches of the island and the place offers to the visitors everything could someone look for. 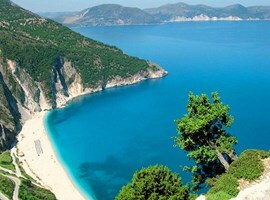 Myrtos: It is one of the biggest beaches of Kefalonia. It is not only popular among the locals but also throughout Greece and worldwide. Many of those who have visited this beach describe it as the “little piece of heaven” and call it breathtaking too. This beach has golden sand surrounded by the vertical cliffs enhancing the beauty of the place. 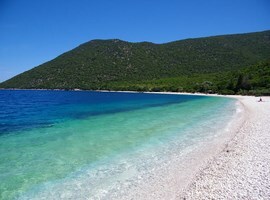 Antisamos: This well-known beach of the island is located near the village of Sami almost 22 km away from Argostoli. The turquoise blue waters, the green hills and the pebbles all around the beach make it extremely beautiful. The snack bar on this beach is famous as offering the best refreshments. A bit of Greek cultural touch is found at this beach. Agia Efimia: It is a little village that hosts a large number of small beaches. They are pebbly, uncrowned and with thousands of clams! Many of these beaches are unknown to the visitors. You might be able to discover a new one yourself! One of the beaches here has a scuba diving school where you can spend some adventurous time. 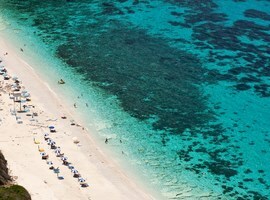 Skala Beach: This beach is soft, it has white sand and crystal blue waters which surely contributes to its beauty. It is located near the village of Skala. It is the best for even those who have issues with the mobility. It has also been awarded with the Blue Flag Award. 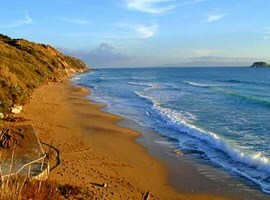 Lixouri: It is the second largest village of Kefalonia that has a plenty of popular beaches. The beach nearest to this village is the Lepada beach. It is the beach of red sand. It is truly amazing and doubtless the best for swimming. Finding accommodation in Kefalonia is easy. A number of villas, resorts, luxury hotels as well as affordable apartments are available in the island. It is ideal for all even for those who have a low budget. You can manage to find an easy accommodation where you can relax for the day and enjoy your time to its full. Many night-partying resorts are also easily available here. The local specialities of Kefalonia that you can’t lose if you visit the island are known to be the meat pie and the tsigaridia. The cheese pies which you can find them at the bakeries of Argostoli are out of this world. Also the cakes of the café at the Venetian fortress in Kastro are amazingly tasty and delicious. 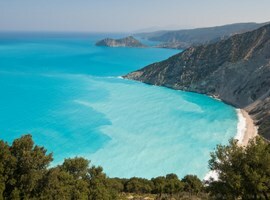 Kefalonia is not only a land that will be attractive for the sunbathers and walkers. Plenty of sports can also be enjoyed on this island of Ionia. The visitors can enjoy hiking, climbing, mountain biking and scuba diving here too. Although it is one of the largest islands you can still easily find lonely places where you can relax and have some private time. 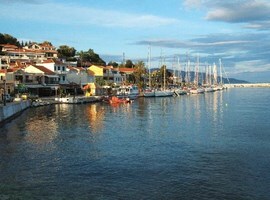 Sami, Lixouri, Fiskardo, Poros and Argostoli are one of the most loved tourist spots of the entire island. Although these are villages, they have got a well-developed infrastructure that has always supported a large number of tourists throughout the year especially in summers. The Myrtos beach on the north is the most photographed spot on the island because of its golden sandy beach and its breath-taking beauty. Apart from the beaches, the mountains, the cliffs and caves of the island are also well known. The cave of Saint Gerassimos, the cave of Drongorati, the Melissani’s underground lake and the churches and monasteries deserve your attention. The work done out on the limestone rock is splendid and many of the tourists love to explore the caves and caverns made out of this rock. All those who will come to visit this beautiful island will never get bored and will never forget it. 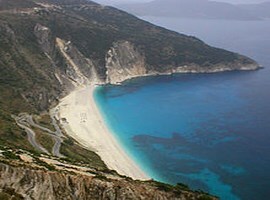 That’s because there a number of things to do and to see in Kefalonia. If you want to enjoy walking, then you walk along the mountain paths and explore the natural beauty. You can do motor boating at the shores of the Ionian Sea and to enjoy other water sports. The view of the Lake Melissani is also one of the most desirable places in the island. The natural daylight and the sunshine pouring onto the cave near is a scene that many love seeing. Nevertheless, the time spent here would be truly wonderful. Kids, adults, couples, friends and families alike will be going home making great memories from here. You will cherish the time spent here in years to come.